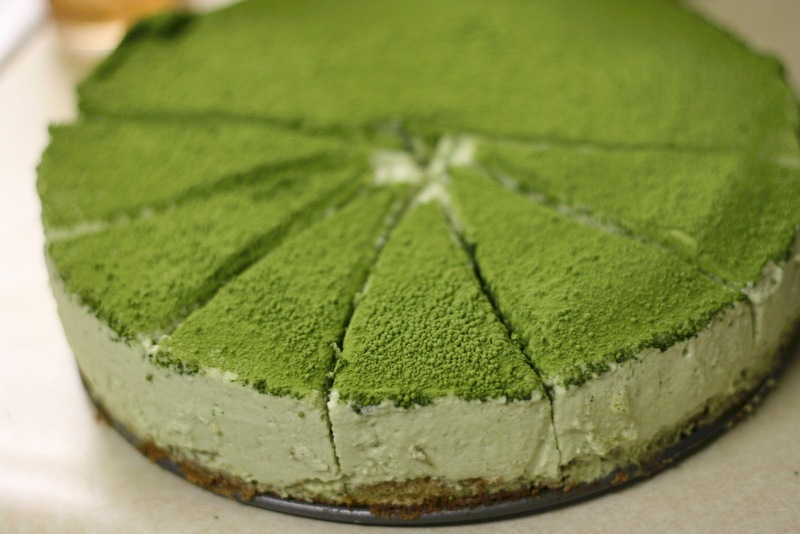 Light and fluffy green tea mousse cake, with a mild green tea taste and a pretty pale green color! 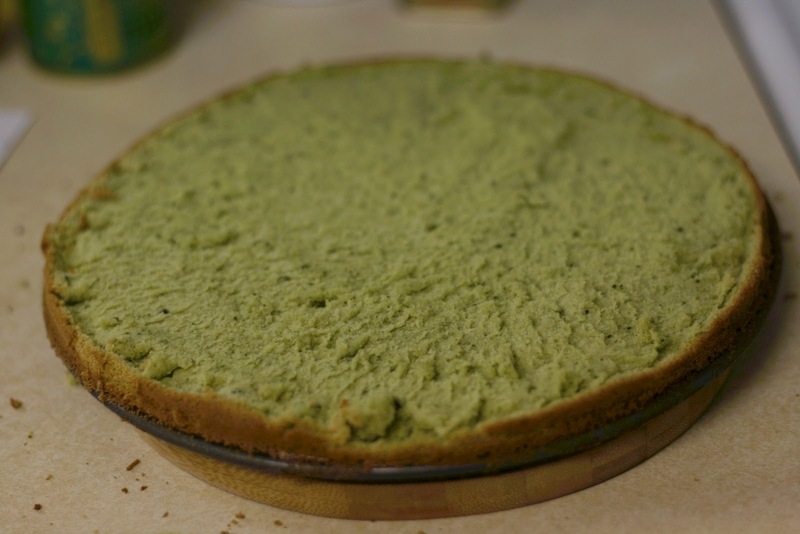 Alternating layers of green tea-flavored sponge cake and mousse make up this cake. I adapted this recipe from Yochana’s Cake Delight, which was originally written in metric units and then roughly converted to US cooking units by me. I think it turned out pretty well, and people seemed to like it. one half of the sponge cake. love that green color! (1) Mix egg yolks, 1/2 cup sugar, water and oil together and stir till mixture is smooth. (2) Add in flour and green tea powder and mix evenly. (3) Whisk egg white with sugar till stiff peak (may take a while! I read that having the egg whites at room temperature helps). Fold in egg yolk mixture and pour mixture into a 9″ springform cake pan. (4) Bake at 350 F for about 30 mins, or until skewer inserted comes out clean. (5) Leave cake to cool on wire rack and slice cake in half lengthwise into 2 slices. Place 1 slice of cake into a 9″ springform cake pan. (1) Heat milk till warm (not boiling). Remove from heat and transfer to mixing bowl, then add in sugar and green tea powder. Stir till evenly mixed. Add egg yolks and whisk quickly. Be careful not to allow the egg yolk to overcook or it will become lumpy. (2) Add in melted gelatine mixture and leave to cool. (3) Make whipped cream – pour whipping cream into mixing bowl and use hand mixer to whip for about 10-15 minutes until soft peaks form. You could technically do this by hand but I imagine your hand would fall off first. Fold in whipped cream into the milk/yolk mixture – this is the mousse filling. (4) Pour half of the mousse filling onto the prepared cake ring and then top up with the other slice of green tea sponge cake. (5) Pour the rest of the mousse on top and level it evenly. Refrigerate till mousse is set. 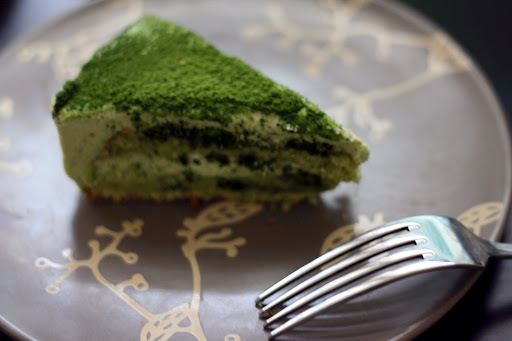 (6) Take out the cake from the cake ring and sieve green tea powder on top and decorate as desired. Hope it turns out well for you! Bon appetit!